I made these two pens for my brother and his wife. He has supported and encouraged my efforts getting Unique Treen up off the ground, plus he gave me the Ifil that they’re made from. Making pens from Ifil is always an interesting challenge because it’s so finicky. A normal pen takes around an hour to make, an Ifil pen takes more like two or three depending on how grumpy it’s going to be. The cigar style pen (top) takes even longer because they’re more complicated to make. The results though, are striking, don’t you think? Mechanism: The mechanism in the slimline pen takes a Cross style insert, and a Parker style insert for the cigar pen. Refills are readily available for both in most office supply stores. Finish: The pen was sanded up to 400 grit, then burnished with 0000 steel wool to bring up a smooth surface. It was then finished with mineral oil, bee’s & carnauba wax and a final polish with hard candle wax. 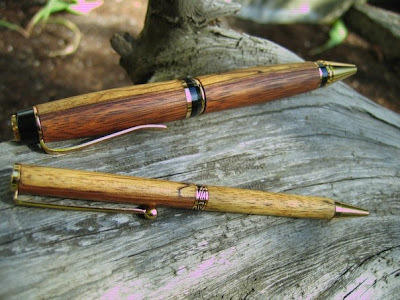 These are 2 of the 4 pens David has turned for me and My wife, Karen. She prefers the heftier cigar style and I the slimline. My pens are with me whenever I leave the house and because I often neglect to take them from my shirt pocket, they have both experienced washing machine baptisms with no lasting ill effect! David's pens are not only stunningly beautiful but they can stand up to abuse and come up writing! It's nice to know that my pens can survive the 'damage' you like to hand out!